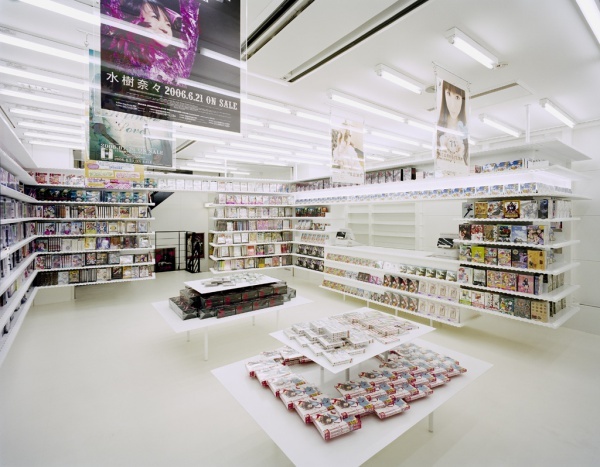 This is an interior designing project for the first floor of a comic store which mainly deals in comic coterie magazines on the main street of Akihabara. 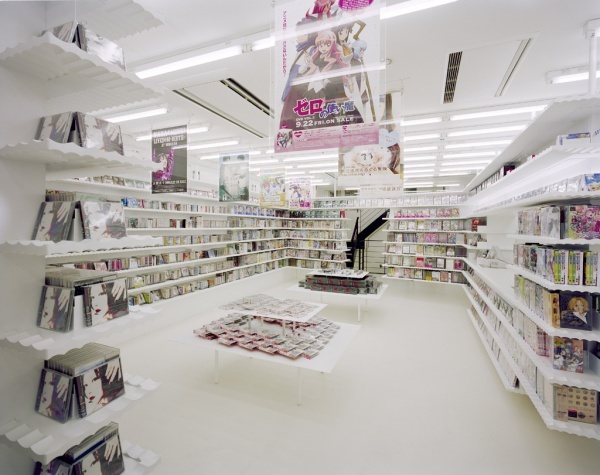 Sold on the first floor are music CDs and DVDs. 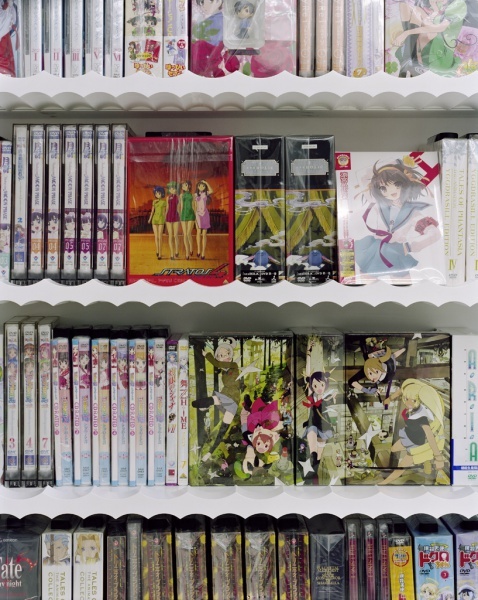 In Akihabara, which is known as Electric Town and the cradle of "moe" culture, a display that makes the merchandise look fewer than in reality is not wanted. 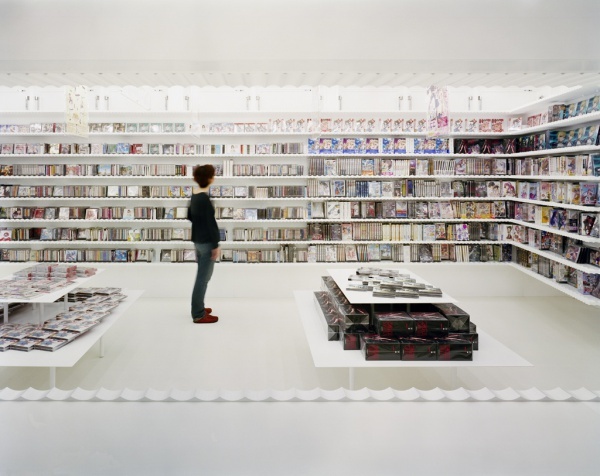 Our first aim was to draw out its uniqueness, as well as to emphasize the density of the items huddling, or the state of there being disorderly miscellaneous items. 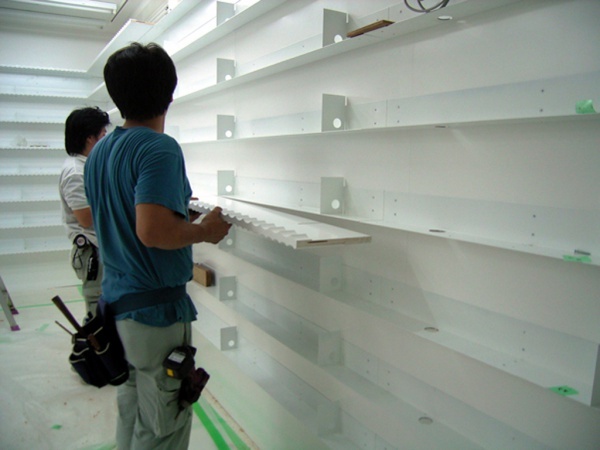 The display shelves, put around the walls like a belt, lead the customers from the entrance to the inside and make them do the circuit of the floor. 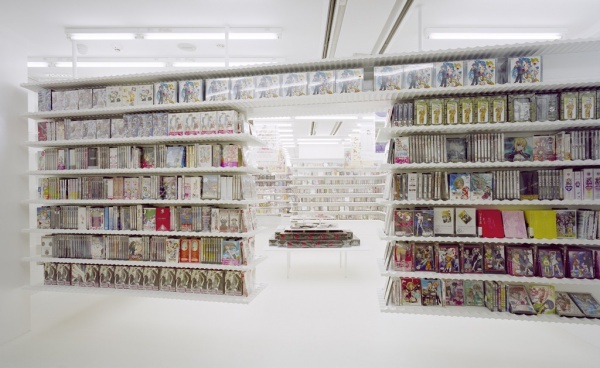 These shelves make the whole floor look like a collector's sanctum full of CDs and DVDs. 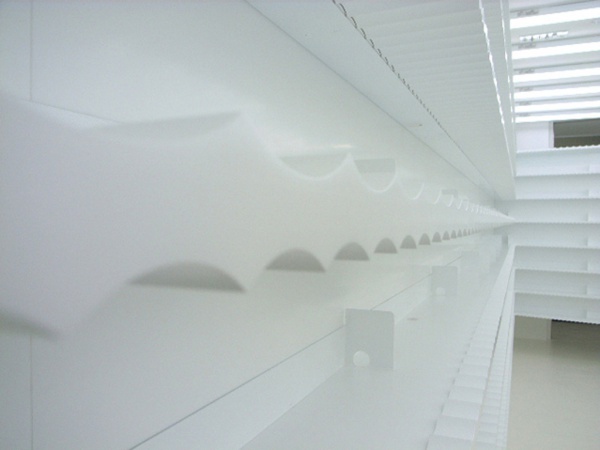 Directing our attention to the cut ends and the back of the shelves which are visible even when the shelves are occupied with plenty of items displayed, we used rib-boards for them. 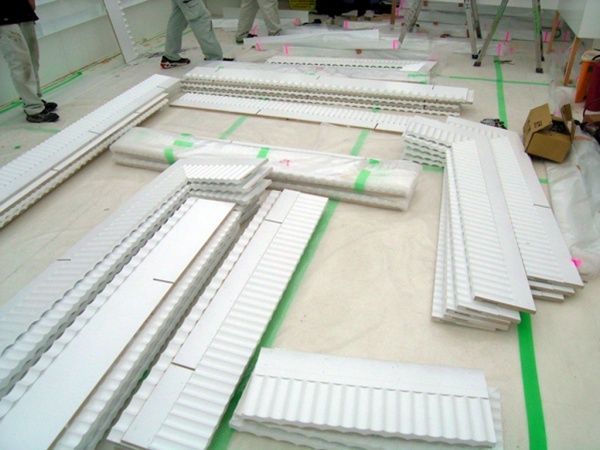 Rib-boards are building materials with uneven surfaces, and are usually used to decorate walls. 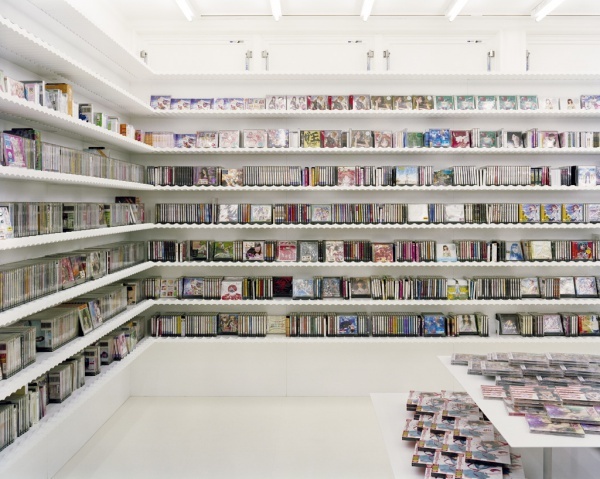 The boards of wavy surfaces emphasize the continuity of the shelves which are placed like a belt, and they work as a catch when they display CDs and DVDs on the surface. 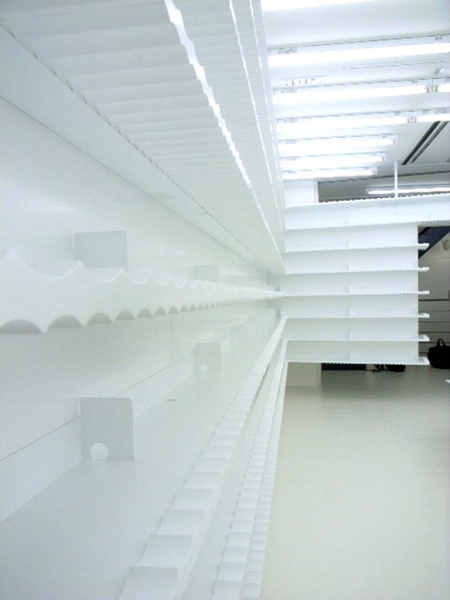 Moreover, their organic shapes give a unique look and a change to the otherwise monotonous display shelves. In order to make two kinds of wavy MDF boards look like a single board, we pressed them to fix together back-to-back and painted them out with urethane enamel. Then the boards are fixed with L-angle to the backboard and are hung from the ceiling with supporting hardware. 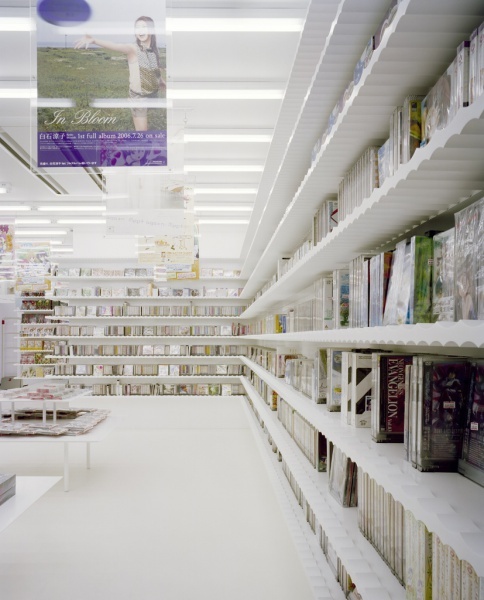 The daylight color fluorescents, orderly disposed at regular intervals of 600 mm (2 ft.), illuminate the whole floor homogeneously white. 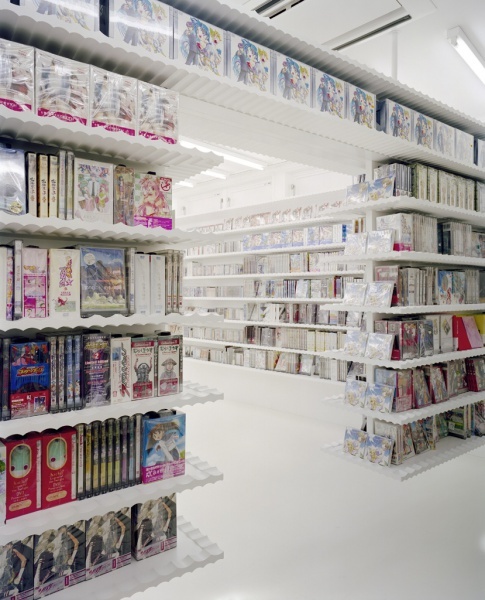 Layers of merchandise and wavy belts float in the white space.